Kids Stay Free Offer – Up to 2 children under 12 stay and eat free when sharing with parents. Please contact us for further details. Waldorf Astoria, Dubai Palm Jumeirah is a classic luxury hotel that is bestowed with the finest touches, for any discerning guest. 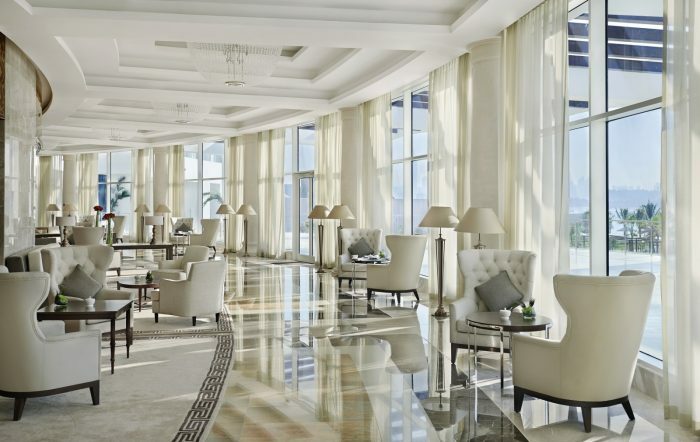 Located on the Palm and looking out at the Arabian Gulf makes Waldorf Astoria a charming property to reside and the private beach, a captivating time pass. Elegant spaces are combined with contemporary interiors at the Waldorf Astoria and guests are surrounded by sophistication and grace. Each guestroom is flourished in comfort; airy guestrooms sprawl this property and every need has been catered for in these timeless guestrooms. Picturesque views of the Gulf and Dubai skyline are best enjoyed on the private balcony as guests create lasting memories. Get sand between your toes as you walk on the soft golden beach and the gentle breeze caresses your skin or enjoy water activities in the warm Sea for some afternoon fun. The Spa is a wonderful sanctuary where guests can let everything fall by the wayside and be spoilt by every stroke and treatment. Whether spending time at one of the fabulous restaurants, one of the pools or unravelling at the beach, Waldorf Astoria is a wonderfully peaceful retreat. Kids Stay Free Offer – Up to 2 children under 12 stay and eat free when sharing with parents. Waldorf Astoria Spa is a private haven, amongst the peaceful sanctuary that is the hotel. Private gardens surround the spa and guests get lost in the exotic beauty. Signature and bespoke treatments are offered to guests for pampering. This secret garden spa hideaway is lavishly decorated, using colours and textures to help relax every soul. Kids Club – Children need to be entertained on vacation and Waldorf Astoria help parents with just that. Kid’s activities are run daily to keep the younger Waldorf guests active and entertained. Private Beach – Whether indulging in a sun set stroll or relaxing on a sun lounger, the breeze, the soft sands and the salty, clear, shimmering sea will awaken your every sense. Relax your mine and lay back as the soundtrack of the Arabian Sea surrounds you. Pools – There a two glistening pools to choose from and guests can pick their view for the day. Guests will find no reason to move as the staff kindly arrange for beverages and food to be brought to your chosen relaxation location. Water Sports Centre – the gentle Sea created the perfect playground for water sports. Be enthralled by activities including paddle boarding, snorkelling, water skiing and pedal boating. For lovers of fish, deep sea fishing excursions are also easily arranged. Fitness Centre – The latest fitness equipment is located at the fitness centre and a host of group classes run for guests to stay fit. Classes include core training, yoga and stretches. For a little additional help, seek a Personal Trainer who will help you meet your desired goal. Open 24 hours, the gym is accessible at the right time for each guest. Waldorf Astoria, Dubai Palm Jumeirah is an enchanting property located on the crescent of the Palm. From the moment you enter, guests will be amazed by the subtle grace and sophistication that uncoils at this hotel. Magnificent unending views of the Arabian Gulf can be enjoyed whilst revelling in breakfast, lunch and dinner and guests are overcome with the Emirati life and the Arabian warmth. Coveted guestrooms are to be admired. Each spacious guestroom provides an amorous retreat for you and your loved one to share private moments that will be remembered for a lifetime. With luxurious amenities and a signature Waldorf Astoria beds, each element of the guestroom is made for comfort and relaxation. Lazing by the stylish pools is stress free and effortless and honeymooners can enjoy some much needed R and R. Spoil yourselves with a couples massage at the Spa or relax on the beach, whatever your choice, the Waldorf Astoria Dubai Palm Jumeirah showers honeymooners with lasting luxury. Dining at the Waldorf Astoria, Dubai Pal Jumeirah is an event. Cuisines from around the world and hand-picked dishes that are mouth-wateringly delicious are cooked with passion. Social by Heinz Beck – Social has the perfect blend of fine dining cuisine in a casual setting. With endless views of the city and creative cuisine that is a modern day interpretation of traditional classics, this is an ambient eatery. Mezzerie – An All day dining restaurant and buffet, Mezzerie serves delightful indulgences from across the globe. LAO – South Eastern Asian dining is a delicious time at LAO. Aromatic dishes are served with a fantastic choice of wines for your pleasure. Peacock Alley, Tea Lounge – Overlooking the ocean whilst the sun sets at Peacock Alley makes this a wonderful place for afternoon tea. Palm Avenue, Poolside Restaurant and Bar – when relaxing by the pool or on the beach, there is very little reason to move. Palm Avenue has an array of gourmet meals for each guest and their culinary mood. Serefina Bar and Lounge – Refreshing cocktails are shaken and stirred, with fresh fruits and juices to create unforgettable cocktails.